The subject of the altarpiece is St. Basil Celebrating Mass in the presence of the Arian Emperor Valens. St. Basil is so involved in his devotion at Mass during the Feast of the Epiphany in 372 that he does not notice Emperor Valentius enter with his retinue. On the other side of the pilaster, on the left of the aisle is the Altar of St. Basil the Great. Pietro Subleyras (1699-1749) showed St. Basil celebrating solemn Mass for Epiphany in 372 and so involved in his devotion that he is oblivious to the entry of the Emperor Valentius with his retinue. In the passage between the Gregorian Chapel and the right hand crossing, behind the St. Longinus pier, is the St. 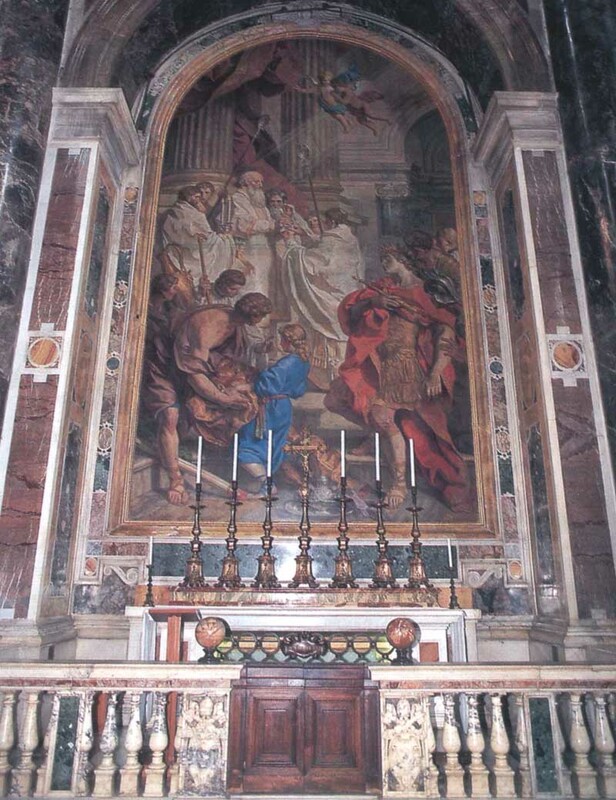 Basil Magno Altar with its altarpiece painted in 1745 by a French artist who had settled in Rome, Pierre Subleyras, and transformed almost immediately into a mosaic under the supervision of Pier Leone Ghezzi. The work showing Bishop Basil who continues to celebrate Mass, regardless of the entry of Emperor Valens and his followers into the church, expresses the gifts of this protagonist of Roman painting in the mid 18th century. Its majestic descriptive simplicity, based on a classic balance between the plastic and chromatic masses, also perfectly adapts itself to transformation into mosaic, with the result that it is one of the most successful of the entire series. It should be noted that this altar is the only one that does not have a mosaic altar frontal, but panels of Verona red marble with white Carrara marble moldings. The painting that served as the cartoon for this altarpiece was commissioned from Pierre Subleyras on 13 September 1743. 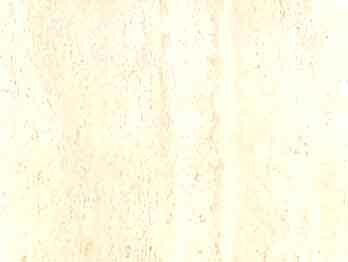 He was paid for the picture, which is now in S. Maria degli Angeli, Rome, from 23 December 1743 to 29 December 1747. The mosaic was made from 1748 to 1751 by Guglielmo Paleat, Giuseppe Ottaviani, Enroco Enuo, and Nicolo Onofri. 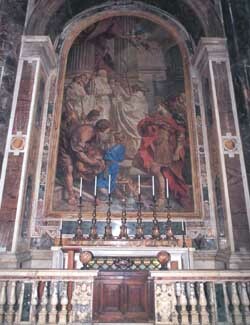 Originally, the altar contained a picture of Saint Basil by Girolamo Muziano, finished by Cesare Nebbie, which is now lost. In 1723-24 Luigi Vanvitelli painted a cartoon after the Muziano for the use of the mosaicists, but the mosaic was never made.